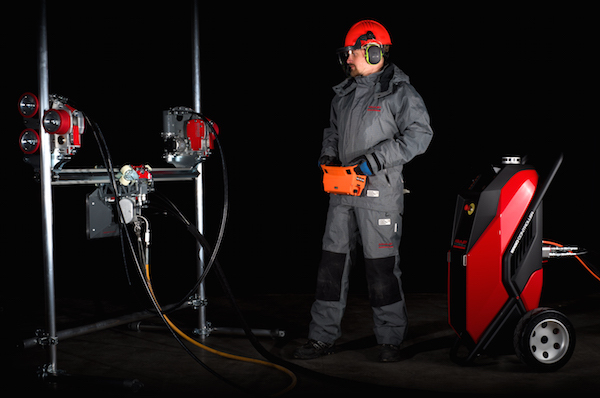 Aquajet Systems AB, a global leader in hydrodemolition robot manufacturing recently acquired by Brokk AB, will launch the Ergo System in the United States at World of Concrete 2019. The robot offers four times the power of a hand lance in a compact footprint that contractors can easily move around the jobsite. It is ideal for work on floors, walls and ceilings. The Ergo System incorporates: the controller unit, which powers and controls the hydraulics, the Ergo Power Head, which manipulates the high pressure lance, and either the spine or the climber, unique systems used to support and maneuver the power head, based on project needs. 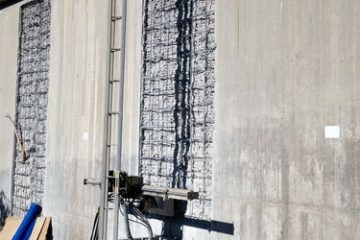 The climber attaches to any standard scaffolding pipes and robotically moves along it to deliver powerful hydrodemolition forces for vertical concrete removal and repair, such as high-rise construction. The system exerts an impressive 1,000 newtons of reaction force, which is about half of the force employed by Aquajet’s largest hydrodemolition robot, the Aqua Cutter 710V. The robot can handle higher volumes of water, as much as four times greater reaction force than a human operator with a hand lance. This means the machine can remove concrete faster and easier. 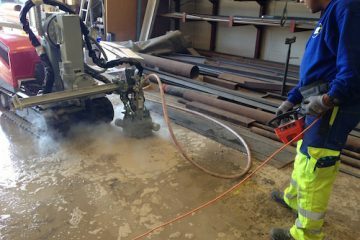 Hydrodemolition robots, such as the Ergo System, remove concrete to a preset depth consistently. Alternatively, a hand lance will likely leave inconsistent depths due to being held by an operator. This means contractors may have to do another pass with handheld breakers to even out the surface. Contractors can easily move the 271-pound (123-kilogram) Ergo Controller unit around the jobsite and over soft or rough surfaces due to the wide wheels and low ground pressure. At just 44 inches tall and 17 inches wide, the Ergo transports easily on a pallet. Aquajet Systems, which was recently acquired by Brokk AB, is known as the industry leader in hydrodemolition machines and solutions, both in terms of quality and volume. The company’s headquarters and production facilities are in Holsbybrunn, Sweden. Similar to Brokk, Aquajet sells globally. Brokk Inc. is responsible for the sale of Aquajet products in the U.S. For more information: Aquajet Systems AB, Brunnsvagen 15, SE-570 15, Holsbybrunn, Sweden; +46 383 508 01; aquajet@aquajet.se; www.aquajet.se; YouTube; Facebook; LinkedIn andVimeo. info@brokkinc.com; www.brokk.com; Facebook; YouTube; LinkedIn andTwitter.